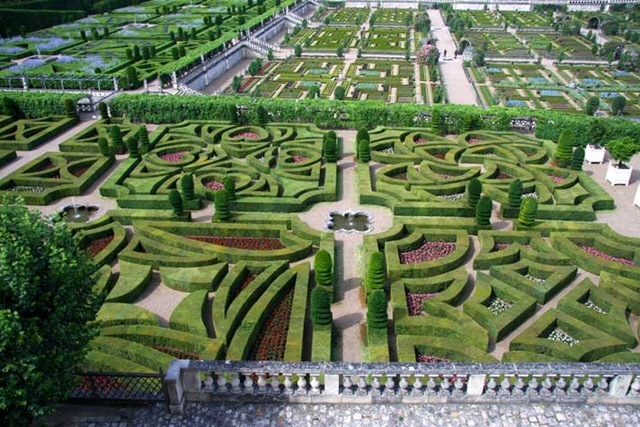 We came here to Savonnières mainly to see the supposedly spectacular formal gardens at the château de Villandry. We set off in the morning to cycle the two or three miles to Villandry hoping to beat the crowds that might arrive for the afternoon. Our 600 cycling miles scrolled passed on way – notional target of 100 miles a week achieved, yeah! Naturally, there were already a lot of visitors but it was surprisingly uncrowded in the gardens themselves. Maybe they were all inside the chateau itself. In our normal cheapskate fashion, we went for the gardens-only ticket (€6.00 each- very reasonable). I’m not the world’s greatest fan of gardens, especially those which are extremely formal. I always think Mother Nature tends to do a much more enjoyable job. However, the extreme precision of the garden layouts at the chateau de Villandry are, I must confess, very impressive. It isn’t the kind of garden that you’d fire up the charcoal in then relax by cracking a few beers while it burns up, but it is undeniably very enjoyable to look at. It makes for a very interesting photographic subject. Don’t touch anything, though, it looks as though it just may break. 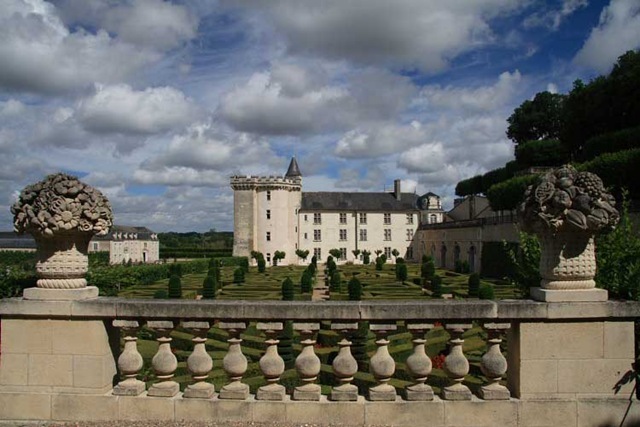 Villandry, the last of the great châteaux built near La Loire, was completed in about 1536. It is still privately owned by the descendents of one Dr Joachim Carvallo who bought it in 1906 to save it from destruction. 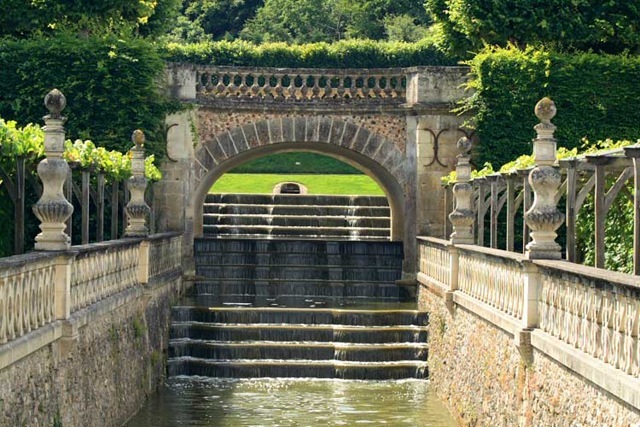 He recreated the very formal gardens that exist now following the styles used by the original plantings. There is an ornamental garden depicting various types of love (so says the guide), a kitchen garden (which is also very ornamental even though vegetables are involved – so say I), a water garden with fish the size of whales, a medicinal herb garden and a maze. The strongest visual impact comes from the geometric designs of both the ornamental and kitchen gardens. I know statistics can rapidly get boring but some just have to be repeated to give an idea of the scale of the effort involved in the upkeep of this place. Surrounding the garden are 1,260 lime trees which take four gardeners four months just to prune. There are 52 km of box hedging. 250,000 flower and vegetable plants are raised and planted out every year. All the weeding must be manual because, apparently, the box hedges which surround every plot have very delicate roots. The vegetables are harvested and many are left out for the public to help themselves. There is no price, they just ask for a voluntary contribution for the gardeners. Planting is kept very authentic; there are no potatoes, for example, since, in 1536 no one had invented Americans or potatoes. 🙂 (With humble apologies to native Americans.) We grabbed a Euro’s worth of broad beans. It was great – I enjoyed it much more than I thought I would.